How are woven wraps sized? Wraps are sized by length. A shorter wrap has a smaller number, so a size 2 is much shorter than a size 6. The awesome thing about woven wraps is that just about ANYONE can wear just about ANY size wrap - they aren't customized to your shape like k'tans or pocket slings. The biggest factor in selecting the size or length of wrap is how many times you'd like it to wrap around yourself. A size 2 or 3 wrap will probably complete one loop around your body, so the number of "carries," or ways to tie the wrap, is limited. A longer wrap has more length to play with so there are more ways to wrap it. What is a base size wrap? A base size is generally the size in which you can tie a Front Wrap Cross Carry (FWCC) - that's the first way many of us learn to tie on a woven wrap. It's basically a wrap that is long enough so that you can tie the "full size carries," or carries with several passes of fabric over the baby. FWCC consists of 3 passes (it wraps around the body 3 times). Every body is different, therefore there is a wide range of base sizes. Typically, a person who wears a small shirt size could be a base size 5, a medium shirt size is typically base size 6 and large sizes are usually base size 7, but sometimes your base is longer or shorter than you might expect. And it can change as your baby grows! That's why it's important to try wraps to get a feel for what size you need, since there's no precise formula to follow. 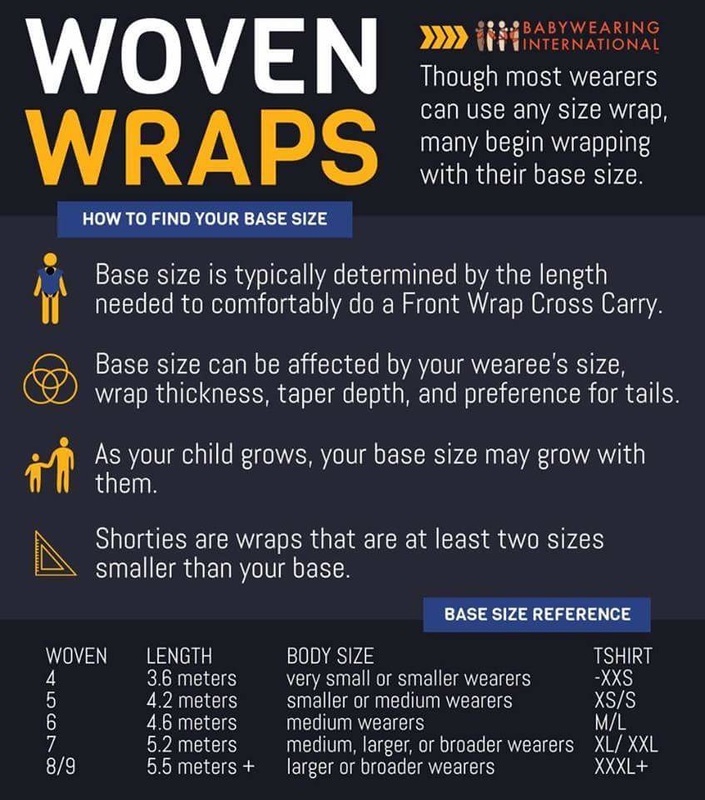 As stated previously, just about anyone can use just about any size wrap, but the way they tie the wrap will have to vary depending the length of wrap they have and their personal size. What does "base minus two" mean? "Base minus two" size means the wearer should use a wrap that is two sizes smaller than their base size. The same applies to "base minus one" or three or any number. For example, a person who is typically a base size 6 would need a size 4 for any carries that call for a base-2. These shorter sizes are also referred to as "shorties." Once you've acquired a base size wrap, think about getting a shortie next: this size does carries with fewer passes like a ruck back carry, kangaroo front carry, or traditional sling carry. It's nice to be able to do these carries without super long tails (the ends of the wrap) getting in your way. How long are woven wraps? These are the main sizes of woven wraps. Sometimes you'll hear of "mid" sizes like "a long four" or "a short six" - these are typically 6-12 inches longer or shorter than normal. Normal varies by a few inches, too. But generally, these are the measurements of woven wraps. You'll notice they increase in half meter increments. For ideas on how to use each size, I love these charts from wearingwiki.com. They are great for finding carries to do with each size. 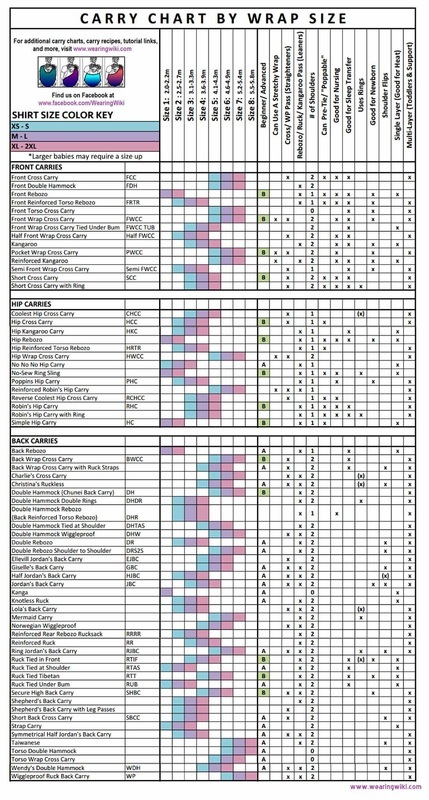 An extensive list of tutorials with carries listed by size is also available on the Tutorials page of this site.